Today marks the 50th anniversary of the death of legendary civil rights leader Dr. Martin Luther King, Jr.
One of history's most significant visionaries and voices, he was struck down by an assassin's bullet on April 4, 1968, on the balcony of the Lorraine Motel in Memphis, Tennessee. 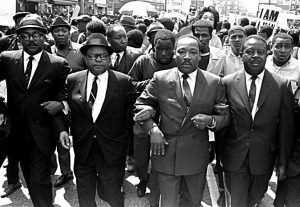 King, 39, was there marching on behalf of striking sanitation workers. The night before, in his famous "Mountain Top" speech, King called for the United States to defend for all its citizens the rights promised to them under the US Constitution and the Declaration of Independence, and stated that he would never give up until these natural rights were protected. 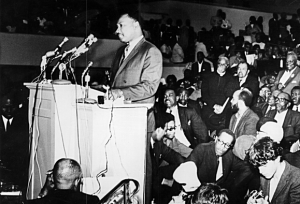 The Minister and and Nobel Peace Prize Recipient had already served as the powerful force behind the passage of the 1964 Civil Rights and 1965 Voting Rights Acts -- but understood that economic injustice was an equally dangerous threat under the broader umbrella of human rights. "Somewhere I read of the freedom of assembly. Somewhere I read of the freedom of speech. Somewhere I read of the freedom of press. Somewhere I read that the greatness of America is the right to protest for rights." King's work, words and sacrifice left an indelible imprint on history, and the worldwide commemoration ceremonies and tributes remind us how relevant his message is in today's world. Thousands traveled to Memphis to celebrate King's legacy, to commemorate the place of his death and to look for inspiration and answers - fifty years later - to the threats against our current civil and human rights. May we find within his words the answers, if not the inspiration. 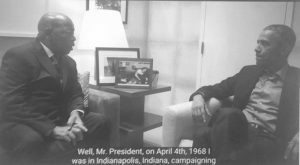 Among the most memorable tributes - a conversation with former President Barack Obama and Congressman John Lewis on King's legacy and mission. "I have been to the mountain top ... I may not get there with you. but I want you to know tonight that we as a people will get to the promised land."